You've found the perfect recipe for dinner tonight (this simple coconut salmon à la Ashley Benson) and are halfway through making it when you realize a key ingredient that brings it all together is missing: white wine. You have two options. Option one is to skip the wine, reducing the overall flavor of the dish and—let's be real—we don’t want to be basic like that. Lucky for us, option two is available, allowing us to get creative and make use of the wine substitutes that are probably already lying around in the pantry. Thanks to the rising popularity of molecular gastronomy, understanding the science behind cooking and the interaction on a molecular level between ingredients has never been simpler. When it comes to wine, be it red, white, or rosé, the alcohol content is what's responsible for enhancing the flavor profiles of dishes. 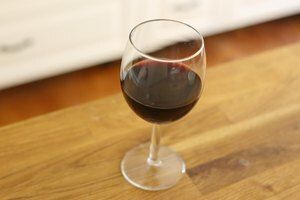 Heating wine causes a chemical reaction to occur between the alcohol and ingredients already in the pan, resulting in fragrant chemical compounds known as esters and aldehydes that transform the final product. And, the wine you pick depends on if you're cooking red meat, fish or vegetables; red wines are used for color and dryness, whereas white wines are known to enhance the acidity of dishes. Knowing this makes it easier to pick out substitutes to use instead of wine in cooking. 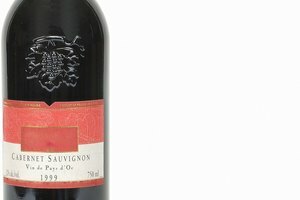 Just follow our handy guide, and you’ll be a wine substitute aficionado in no time. If the dish you’re cooking requires color, a stronger flavor, or body to it that red wine usually delivers, try these three substitutes. Red wine vinegar In need of acidity in your dish? Substituting with red wine vinegar is the way to go. Made by slowly fermenting red wine for a few months—which you can totally do yourself, BTW—red wine vinegar often needs to be combined with grape juice or water to decrease its overall acidity level, and to recreate the original flavor. Pomegranate juice The flavors and aroma of pomegranate juice are similar to that of red wine, making it a suitable red wine replacement. It is, however, less acidic in nature, so if your dish requires a tad more of a punch, a splash of red wine vinegar mixed with the juice will do just the trick. And an added bonus to using this substitute? Pomegranates are very heart healthy. Beef broth If the sauce in question requires body, then beef broth makes an excellent substitute for red wine in a recipe. While beef broth brings the flavor, it tends to lack in acidity, so for an extra kick, don’t forget to add in some vinegar. Finding a white wine substitute can sometimes be a challenge because of the variety of wines that exist, each offering different depth and flavor—light, sweet, woody, or buttery. 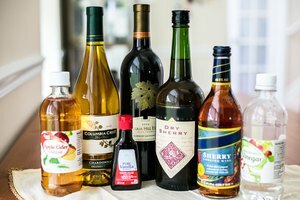 Like its red wine counterpart, white wine vinegar is made from fermenting white wine, resulting in a concentrated flavor and higher acidic content. 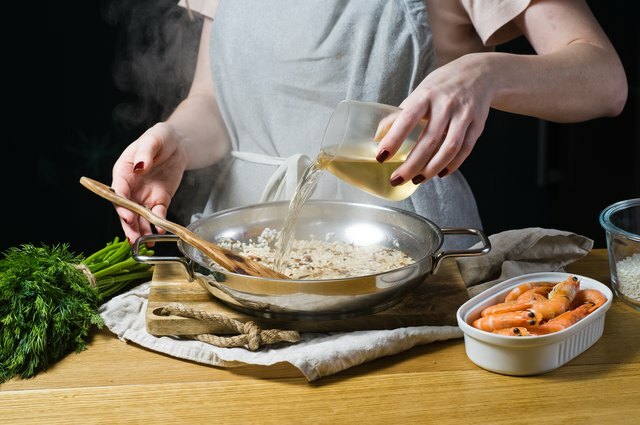 White wine vinegar works particularly well in recipes with chicken and vegetables. The sugar content of apple juice makes it good for dishes that call for a sweet wine such as a Riesling or Moscato. It cannot, however, be used to replace large quantities of wine in a recipe. Grape juice, on the other hand, has a flavor that’s similar to wine and can be used to substitute white wine in an equal ratio. Chicken or vegetable broth Chicken broth is the perfect replacement for dishes that require a buttery flavor that wines like Chardonnay provide. And for vegetarians, just use a vegetable-based broth. Adding in a splash of white wine vinegar to amp up the broth’s acidity certainly wouldn't hurt, either. If you want to save the bubbly for a special occasion, sparkling apple cider or ginger ale can serve as good non-alcoholic substitutes to recipes that call for champagne or rosés. A good substitute for cooking sherry, which is a fortified blend of wines, is a sweet juice such as apple or orange. You’ll be happy to learn that a lot of the substitutes for red and white wine—both chicken and beef broth, apple cider, and white grape juice—also work as great substitutes for beer in cooking. Once you know what wine the dish calls for, finding a substitute is easy. Just keep in mind the final flavor you want the dish to have, and before you know it, you’ll be a well-seasoned pro. Which means one thing…more wine for drinking! Christabel Lobo is freelance writer, certified Hatha yoga and meditation teacher currently based in Mysore, south India’s yoga capital. Her writing has appeared in Fodor’s, London’s Evening Standard, Silkwinds, HuffPost, Barclays Travel, Pint Size Gourmets and on her personal yoga & travel blog, Where’s Bel.